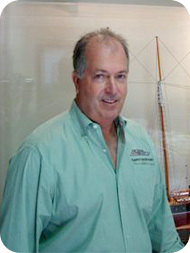 Yacht Broker Mack Carroll II : Atlantic Yacht & Ship, Inc. I was born in South Carolina with a keen interest in hunting and fishing. For this reason, it was only natural for me to end up in the marine and boating industries. I graduated from the Citadel in Charleston, South Carolina, where I enjoyed being a member of the sailing team. The sailing team at that time ranked third in the nation, and I absorbed much knowledge and experience by being a part of it. The competitive spirit that enhanced my sailing career carried through with my dedication to developing two family businesses in South Carolina, a 10-acre automobile dealership and a beach and golf resort located in Myrtle Beach. In the mid 1980s, I decided to pursue a career in the yacht brokerage industry in Myrtle Beach. As it would happen, most of my clients wanted to go to Florida to look at boats, which led to my position at Atlantic Yacht & Ship, Inc.
As it turned out, I ended up with a group of great partners and have recently sold a 138′ Sovereign motor yacht, a 130′ Westport Trideck, and a 132′ Oceanfast. It has been a pleasure to welcome my sons Trevor Carroll and Christopher Carroll to Atlantic Yacht and Ship as brokers. They have proved a great support staff so that the needs and questions of our clients are addressed promptly. With 25 years in the business and working as a team, we can all help you get the most out of your vessel. We assist in the sale of many For Sale By Owner boats and can get yacht financing for prospective buyers. Luxury yachts from 70-200 feet are my specialty.